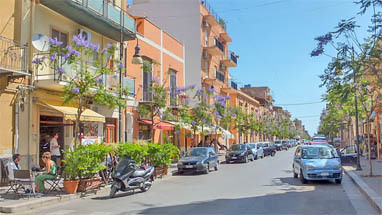 Casa Maria is located in the historic center of the small Sicilian town of Santa Flavia (red umbrella on the right) – a calm, but not sleepy suburb of Palermo. The central location has a major benefit: within a hundred-meter radius are cafes, bars, shops, pizzerias, and at least one supermarket. But the best thing about its location is this: the apartment is just 500m from the train station. So you can take the local train and in just twenty minutes get to Palermo. So this holiday apartment is a perfect jumping off point for holidays in Sicily that are "auto-free". The image below shows the south facade of Casa Maria. On the ground floor you can see entrances to the holiday apartments named Luna, Mare, Terra and the entrance to the stairway which leads to other apartments. Not shown in this image is Livia, located on the first floor on the north side of the building (opposite Clelia). An overview of the apartments can be found in the next section. Here you can find an overview of the features of the holiday apartments at Casa Maria. Click on the name of the apartment (first column) for more information (layout, photos, etc.). Subject to change. All figures rounded. Don't like mass tourism? 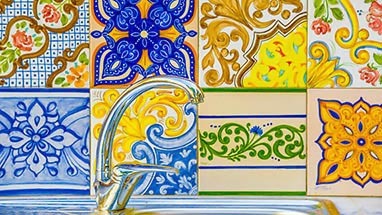 Interested in local Sicilian culture? Want to take a dip now and then in the sea? If "yes" to all three, Casa Maria is the perfect "base camp" for holidays in Sicily. It is located in the old town center of Santa Flavia where traditional bakeries, pizzerias, and of course plenty of cafes are all right around the corner. Add to those a small supermarket, a variety of green grocers and butcher shops, and you get a complete picture. There are several nearby beaches. The nearest is only a kilometer and a half from Casa Maria. The owner (see contact) also offers additional free access to a private inlet about 7 km away. Casa Maria is great for convenience and for being "close to civilization". But even for those who like a more urban environment, the apartments are perfect. The reason is Trenitalia. The proximity to the train means that during your holidays in Sicily, you can reach Palermo in just thirty minutes – and that includes the walking time from Casa Maria to the station. Palermo is one of the most underrated cities in Europe, despite drawing more and more visitors every year enjoying their holidays in Sicily. Part of the reason is why it is more and more popular is that it's one of the safest cities in Europe. Indeed, today it could even be called an "anti-mafia" capital. One thing hasn't changed though: the hustle and bustle of its wildly colorful city life. Luckily, Santa Flavia and Casa Maria offer a perfect contrast – you get the best of both worlds. Casa Maria offers another major benefit: you can escape the northern European winter here. Sicily's winter season consists mostly of occasional rains that look more like springtime to the north - indeed, the island would become a desert without its rainy season. Luckily, the holiday apartments at Casa Maria are also heated. In the summertime, the situation is reversed: the apartments are air conditioned so you can relax indoors after being out in the hot Sicilian sun. Of course, the apartments also come with all the usual amenities including washing machine, TV, and internet. The apartment's interior was planned by interior decorator Maria Carnevale and artist Mirella Pipia, and implemented by local artisans. 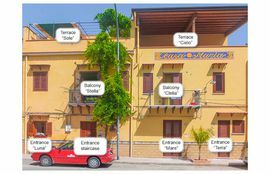 Casa Maria's holiday apartments are a part of the Solemar Sicilia language school (see contact). The classrooms (Casa Giovanna) are just 300 m away along a parallel street. There is also a safe area for parking motorcycles and bicycles. The holiday apartments at Casa Maria are not only ideal for those who enjoy organized activities. 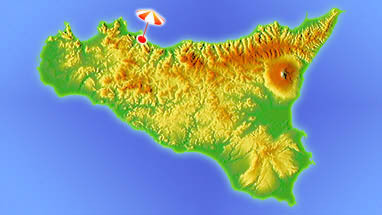 Solemar Sicilia also helps more independently-minded guests to plan their holidays in Sicily. Most guests do a combination of both: they learn Italian together at Casa Giovanna in the mornings, and in the evenings explore Sicily on their own. 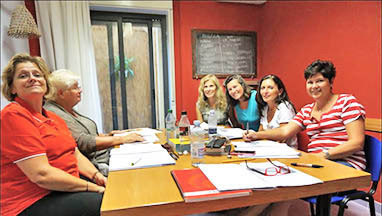 Would you like to learn more about Casa Maria? The holiday apartments available at Casa Maria are supervised by Solemar Sicilia. 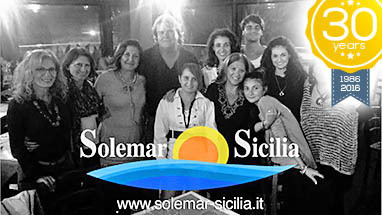 Solemar Sicilia is a Sicilian-German family-run operation that has offered excellent holiday apartments, Bed & Breakfast and hotel accommodation for thirty years. 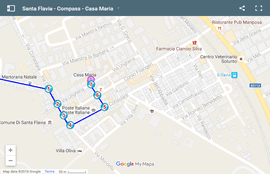 This Trip Tipp Compass covers the route from entering Santa Flavia to Casa Maria.